More big changes coming to southbound Interstate 275 in Tampa! Motorists, get ready for yet another big change on Interstate 275 southbound in Tampa! If you have had the chance or if your travels take you on southbound Interstate 275 in Tampa south of downtown Tampa, you have seen the new southbound lanes take shape along with plenty of brand new signage. Now a new construction milestone is on the horizon when southbound Interstate 275 traffic will get to use the new southbound lanes. Another benefit of the new Interstate 275 southbound lanes is that all the exits – Howard/Armenia Avenues (Exit 42), Himes Avenue (Exit 41B), Dale Mabry Highway (Exit 41A), Lois Avenue (Exit 40B) and Westshore Blvd. (Exit 40A) – will be right lane exits instead of the temporary left lane exits we’ve been used to while the construction project is taking place. No more having to go through temporary ramps to get to where you need to go. Unfortunately, the switch over is going to mean some inconvenience and the switch over will be taking place during night time hours. This will mean detours and traffic delays while the switch over takes place. According to Tampa Bay Interstates, the switch over will take place on Friday evening, 27 March 2015 beginning at 11:30 PM and wrapped up by Saturday morning, 28 March 2015 at 5:30 AM. This is subject to change due to weather conditions; if weather conditions make it unsafe to do the switch over it will be done the next night or a night when conditions are safe. Expect to be detoured off of Interstate 275 southbound (this includes westbound Interstate 4 transitioning to southbound Interstate 275) at Exit 45A, which is Downtown East/West which will put you on either Jefferson Street or Ashley Drive in downtown Tampa. Go south on either street to Kennedy Blvd., also known as FL 60. Follow Kennedy Blvd. west across the Hillsborough River. Kennedy Blvd. provides access to the southbound Interstate 275 exits that will be closed during the switch over: Armenia/Howard Avenues, Himes Avenue, Dale Mabry Highway (US 92), Lois Avenue and Westshore Blvd. Now if you are headed to Tampa International Airport or St. Petersburg, continue to head west on Kennedy Blvd. To reach St. Petersburg you will take a left at the intersection where Kennedy Blvd. continues west to southbound Interstate 275. To reach Tampa International Airport, continue straight (Kennedy Blvd. becomes Memorial Highway) and follow the signs. Be sure to be in your right lane as you approach the Tampa International Airport entrance and watch for traffic coming from northbound Interstate 275 as you make the lane changes. ALTERNATIVE DETOUR ROUTE FOR ST. PETERSBURG IF COMING FROM WESTBOUND INTERSTATE 4: Take the Selmon Crosstown connector to the Selmon Crosstown Expressway (FL Toll 618), and follow the Selmon Crosstown westbound to its end at Gandy Blvd. (US 92). West on Gandy Blvd. across the Gandy Bridge to St. Petersburg; continue west on Gandy Blvd. to Interstate 275 south. Be aware of construction on Gandy Blvd. at 4 St N and Martin Luther King St N as there are temporary lane shifts in the area. Be advised that the Selmon Crosstown is a toll road and tolls are collected via SunPass or toll-by-plate (no cash is accepted). But believe me, it’s worth the toll to get around the expected congestion when the detours on Interstate 275 are in effect. When the new southbound Interstate 275 lanes open, be aware that the new right lane exits at Exits 41B, 41A and 40B are in close succession. Plan accordingly and be in the right lane for your intended exit. Hopefully all the construction on Interstate 275 south of downtown Tampa should be wrapped up in the latter part of 2016. But when it’s all said and done, you will have four lanes of travel in either direction and there will be space in the center median for what I hope someday will be the answer to the Tampa Bay region’s transit needs: Rail based mass transit in the form of commuter rail or light rail. After all, Miami and Orlando already have rail based mass transit; the time has now come for Tampa to have rail based mass transit which will provide a much needed turbo-boost to the economy of the Tampa Bay region. As I have mentioned previously, you can widen Interstate 275 to 20 lanes but you will still have traffic gridlock because of not so many transit choices. By now you more than likely have heard about a potential replacement of the northbound span of the Howard Frankland Bridge, which carries Interstate 275 traffic between St. Petersburg and Tampa. Of course the Howard Frankland Bridge – known informally over the years as the Frankenstein and the Car Strangled Banner in the Howard Frankland’s single four lane span heydays – is an important piece of the Tampa Bay region’s transportation puzzle and will remain so for the foreseeable future. As the Tampa Bay region’s interstate highways began to take shape with the introduction of Interstate 4 into Tampa and terminating in St. Petersburg, a third crossing of Tampa Bay was a necessity. In the late 1950’s the needed real estate was available to develop the Tampa Bay region’s interstate highways piece by piece. With that in mind, the Howard Frankland Bridge was constructed as a slender four lane span with a low raised concrete divider as the center divider. The Howard Frankland Bridge opened to traffic in 1960 which essentially brought Interstate 4 to St. Petersburg, terminating at where Exit 31 (Ulmerton Road/FL 688 and Martin Luther King St N) is located today. Within months of opening head on collisions were getting to be commonplace on the bridge, which led to a Jersey barrier wall being constructed in the center divider with the barrier wall being topped by a low rise fence in the 1970’s. The Howard Frankland’s notorious distinction for so many accidents and traffic backups and mega-delays on either side of the bridge led the Florida DOT to construct a second parallel span – which is higher and more modern that does meet interstate highway standards – and the span was opened to traffic in 1991. The original 1960 span would be refurbished and converted into a span carrying northbound Interstate 275 traffic. The original 1960 Howard Frankland Bridge – despite improvements done in 1991 and 1992 to refurbish the span – is nearing the end of its service life. Despite the eight lanes that the Howard Frankland Bridge is now, the Tampa Bay region’s growth continues at an unprecedented rate (with the only exception being the recent economic downturn). There are plans in the works, according to the Florida DOT, to replace the original 1960 span with a newer, more modern span that better meets interstate standards. Presently on the Howard Frankland’s northbound span is only one emergency breakdown lane and its width is a recipe for major northbound gridlock backed up as far as Exit 32 (4 St N/FL 687) in St. Petersburg if a major accident occurs on the bridge. The replacement northbound span is supposed to follow the curvature and height of the 1991 southbound span and it is supposed to look similar. However, the Florida DOT has the chance to seize the opportunity: A transit corridor that carries light rail or even commuter rail between St. Petersburg and Tampa. The Howard Frankland Bridge is an important piece of the Tampa Bay region’s transportation puzzle. And it will become a more important piece of the transportation puzzle if and when rail based mass transit is introduced to the Tampa Bay region. You probably have this thought in your mind: Our area doesn’t need rail based mass transit; simply more buses will do. You are wrong. Rail based mass transit is a choice of intra-regional travel that we residents of the Tampa Bay region do not have, unlike the residents of Miami-Ft. Lauderdale who have Tri-Rail and Orlando who are just about to have SunRail. Realize that valuable real estate is at a premium today despite the real estate crisis that drove down property values. Even with the improvements going on at Interstate 275 in Tampa you can expand Interstate 275 so much that you can get away with a total of eight lanes, which equates to four lanes in each direction. But eight lanes of Interstate 275 isn’t enough. You can solve the Tampa Bay region’s transit issues by putting more buses on the roads, including the use of so-called “bus rapid transit” or dedicated bus lanes. However, when buses exit the dedicated bus lanes buses are subject to the same traffic delays as other motorists are subjected to daily. However, simply adding more buses – including the express buses from St. Petersburg (operated by the Pinellas Suncoast Transit Authority, or PSTA) or Clearwater (operated by Hillsborough Area Regional Transit, or HART) to downtown Tampa – isn’t enough. So enter rail based mass transit. And I don’t care if it’s commuter rail, light rail or a combination of the two. Miami/Ft. Lauderdale and Orlando are lucky. But for Tampa/St. Petersburg as of today, the only options for rail transit are limited to excursion style rail trips as opposed to commuter style rail trips: Either a day trip on Amtrak’s Silver Star (Trains 91 and 92) to Winter Haven and back, or a trip on a historical six mile stretch of railroad from Parrish to Willow round trip in northern Manatee County at the Florida Railroad Museum. Besides, rail based mass transit would be a major economic shot in the arm for the Tampa Bay region. We would see more and more major companies consider the Tampa Bay region more seriously in their relocation to Florida plans as commuters would have access to more choices. We would see more and more people taking in professional sporting events such as at Tropicana Field in St. Petersburg (home of the Tampa Bay Rays) or at Raymond James Stadium (home of the Tampa Bay Buccaneers) or the Tampa Bay Times Forum – formerly the St. Pete Times Forum (and the home of the Tampa Bay Lightning) – in Tampa, without the hassle and inconvenience of parking and the long trip back home after the game. Imagine for a moment. You live in, let’s say New Tampa. You want to take in a baseball game across the bay in St. Petersburg at Tropicana Field. The Tampa Bay Rays decided after all these years of “let’s move” that staying put at Tropicana Field is a much better option than anything else. Simply hop in your car for a very short ride to the park and ride somewhere in New Tampa, where you pick up a light rail train that follows Bruce B. Downs Blvd. into downtown Tampa. There you switch to a commuter rail train and enjoy a leisurely ride across Tampa Bay using a dedicated rail transit envelope corridor on the Howard Frankland Bridge to St. Petersburg and the Gateway Transit Station located in the Carillon office complex. Then you switch to a light rail train that takes you straight to Tropicana Field in downtown St. Petersburg, get off and make your way to your seat in the 300 Upper Deck Level. Enjoy the pre-game festivities including the National Anthem and the game itself. Furthermore, rail based mass transit can save residents in the Tampa Bay region money in the long run. How can that be? We depend on our cars for easy, yet dependable transportation to get us from Point A to Point B and vice versa. But the downside of car ownership, besides the high gas prices, is car insurance which gets higher and higher at every renewal. You might not realize this, but a major factor that drives your car insurance rates is how many miles do you drive one way to your work place daily. The longer your commute to work is, the more you pay in auto insurance. Let’s do the homework. Assume that you live in New Tampa and that you work in downtown Tampa. As the distance is a little considerable between New Tampa and downtown Tampa as opposed to living in downtown Tampa and walking to work (which is good for your health, but the costs of living in downtown Tampa are quite prohibitive), you would pay a good chunk of money every year in auto insurance premiums. In order to help reduce your auto insurance premiums, you decide to commute to work in downtown Tampa on the light rail route that takes you down Bruce B. Downs. 1. From New Tampa, a light rail line via Bruce B. Downs Blvd. to downtown Tampa. 2. At downtown Tampa, transfer seamlessly over to the commuter rail line which takes you to St. Petersburg by way of the newly created transit corridor on the Howard Frankland Bridge. While you are seated (and concentrating on reading the morning newspaper), watch as you pass by backed up traffic on Interstate 275 during the morning commute. 3. Once in St. Petersburg, arrive at the Gateway Transit Station in the Carillon office complex. Transfer seamlessly to light rail for your trip to downtown St. Petersburg and to work at the First Central Tower at 360 Central Avenue. And another thing I forgot to mention on the subject of why it costs to commute to work, especially if you work in downtown St. Petersburg or downtown Tampa: You have to pay for parking in a parking garage. Parking garage rents can quite considerably impact your personal bottom line, especially if you are working in a clerical position. 1. Wear and tear on your automobile, not to mention the miles you put on your odometer daily. 2. Increased costs of car insurance. Remember, the further your commute to work the more you pay for car insurance. 3. Having to spend a good portion of your personal weekly budget on gasoline for your car. After all, the cost of gasoline keeps climbing – you will wish there is a rail based alternative if and when gas hits $4.00 a gallon in the Tampa Bay region again. 4. Monthly parking garage expenses, especially if your employer does not subsidize your parking. Imagine working a clerical job in downtown St. Petersburg and you are paying $70 a month for parking. 1. The cost of a monthly pass. As you can see, the practical cost of commuting to work using rail based mass transit would just be the cost of a monthly transit pass. In fact, more and more employers offer monthly passes to their employees at a discounted rate in order to entice them to give up driving to work in exchange for a leisurely, yet relaxing commute to work using rail based mass transit. A rail based transit corridor on the Howard Frankland Bridge, as part of the planned reconstruction of the Howard Frankland’s northbound span, would be an important, yet necessary, part of the Tampa Bay region’s transportation puzzle. It would change the face of the Tampa Bay region on an economic scale. Having rail based mass transit on a newly constructed rail corridor of the Howard Frankland Bridge would not only give the Tampa Bay region an economic shot in the arm, there are also plenty of other uses besides commuting to and from work. Let’s say you want to take a vacation or you needed to go out of town on business. You live in St. Petersburg. Right now you have two options: Drive yourself to the airport and pay $9 per day for parking in Tampa International Airport’s economy parking garage. Or pay for taxi or shuttle fare and have them take you to the airport. With rail based mass transit, that would give you yet another option to get to Tampa International Airport. As you live in St. Petersburg, simply drive to the nearest light rail park and ride and catch the light rail over to the Gateway Transit Station in Carillon. There seamlessly transfer to commuter rail for a relaxing trip across Tampa Bay instead of being stuck in gridlocked Interstate 275 traffic. Arrive at Tampa International Airport and catch your flight. And the cost? A one way ticket from where you got on the light rail in St. Petersburg with transfers included. And believe me, it would be a lot less than you paying for airport parking. And you saved yourself the stress of getting to the airport on time to catch your flight. Now let’s say you arrived in town and you are here on business. Or you are here to take in our gorgeous beaches and take it easy. Instead of the hassle of renting a car or taking a taxi or shuttle, simply hop on board rail transit to get you where you want to go. And if you are staying at one of the many resorts out there on the beaches of the Pinellas Suncoast, you can decide to rent a car later if you would like to explore more. We can’t forget Amtrak here. The last time an Amtrak train served St. Petersburg was in February 1984. Today Amtrak’s Silver Star serves Tampa’s Union Station twice daily, Train 91 southbound to Miami and Train 92 northbound to New York City. For those of you in St. Petersburg that want to take a ride on Amtrak, you can either have someone drive you to Tampa or take the bus that runs from the Amtrak ticket office located in a shopping plaza on 110 Av N and US 19 in Pinellas Park. Now how can we attract Amtrak as another transportation choice in St. Petersburg? The dedicated rail corridor on the Howard Frankland Bridge would help. Amtrak service to St. Petersburg can be viable using both a Howard Frankland crossing and the existing CSX Clearwater Subdivision tracks, upgraded to passenger standards. 1. Connect the existing CSX A Line tracks from Tampa Union Station over to a widened Interstate 275 median. The widened median is taking shape as a result of the construction underway on Interstate 275 in Tampa from Westshore Blvd. to downtown Tampa, scheduled to be wrapped up in 2016. 2. Connect and upgrade the track that runs north of the Neve Wye into the Clearwater Subdivision. That way, Amtrak can run service into St. Petersburg like a serpentine circle and at the same time get rid of that reverse move into Tampa Union Station. Presently all Amtrak trains serving Tampa Union Station have to be turned at the Neve Wye, a rail spur and turnaround point located east of Ybor City, and backed into the station. While Tampa is a station stop on the Silver Star, Tampa’s Union Station is what is classified as a stub in facility as opposed to a run through facility as is the case of most railroad stations in the United States. 3. Increase Amtrak’s frequency of Florida service by having the Silver Star’s partner, the Silver Meteor, serve Tampa instead of bypassing it as it is now. 4. Both southbound trains can enter the Neve Wye, follow the track to a crossover track to the CSX Clearwater Subdivision, then proceed on that track to a new station stop in St. Petersburg. Then proceed on the new Howard Frankland rail corridor to Tampa and Tampa Union Station. After Tampa, proceed southbound to Lakeland, Winter Haven, Sebring and all intermediate points to Miami. 5. Both northbound trains can stop in Tampa first. After Tampa follow the new Howard Frankland rail corridor to St. Petersburg and a new station stop. Then follow the CSX Clearwater Subdivision and over the new crossover track to the Neve Wye and eastbound on the CSX A Line to Kissimmee, Orlando, Jacksonville and points north to New York City. East on the CSX line from New Orleans and across Mississippi and Alabama and into Florida at Pensacola. Continue east to Jacksonville. At Jacksonville route the Sunset Limited onto the CSX S Line and follow it south via Ocala and Wildwood. At Dade City use the Vitis Subdivision track (the track that connects Dade City with Lakeland) and turn west onto the CSX A Line towards Tampa. The Eastbound Sunset Limited can follow the route to St. Petersburg first, then Tampa, and on to Miami. Likewise, the westbound Sunset Limited can reverse the direction, stopping in Tampa first, then St. Petersburg, then following the Clearwater Subdivision to the S Line north to Jacksonville. I just wanted to throw in a discussion of Amtrak service and how some ideas for expanded Amtrak service in Florida can become reality thanks to a new Howard Frankland rail corridor. Granted, Amtrak has good service into Florida with two trains daily but there’s plenty of room for improvement as far as service is concerned. Now that the Florida DOT is considering the replacement of the original 1960 Howard Frankland span, the opportunity for improvements including turning the Howard Frankland into a multi purpose road and rail corridor is here. And it can be done. I spoke at one of the Florida DOT public hearings on the replacement of the Howard Frankland Bridge not too long ago. With the exception of a couple of people who spoke at the public hearing, most including me are in agreement that rail based mass transit is the Tampa Bay region’s answer to a good shot in the Tampa/St. Petersburg economic arm. Rail based mass transit will make the Tampa Bay region competitive with other Florida metropolitan areas. Rail based mass transit will attract more and more companies to consider moving their headquarters or major operations to our area over Orlando or Miami. Sure we got Interstate 275. You can widen it all you want, but that alone won’t help the Tampa Bay region’s mass transit woes. Sure we have buses. But buses are subject to the same traffic delays as everyone else, even with so-called “bus rapid transit” when buses exit the dedicated bus lanes to get to their intended destinations. The framework is here. That framework is a regional transit authority called the Tampa Bay Area Regional Transit Authority, or TBARTA for short. What TBARTA could do is a merger of both PSTA and HART to create a seamless transit service throughout the region. Imagine one day you live in New Tampa and you want to go to a Tampa Bay Rays game at Tropicana Field. Instead of hopping in your car and driving Interstate 275 to St. Petersburg and paying for parking at Tropicana Field, you can hop on a mixture of light and commuter rail right to the game. Imagine one day you live in the Gandy area of St. Petersburg and you work in downtown St. Petersburg. Instead of paying outrageously high parking garage fees downtown, you can hop on the light rail and arrive downtown, refreshed and ready to face the work day. Imagine one day … when and if light and commuter rail transit is implemented in the Tampa Bay region, the way we move about in the Tampa Bay region will change. Now that our economy is rebounding, we here in the Tampa Bay region need to seize the opportunity. And that opportunity is rail based mass transit. For those of you in St. Petersburg who use 22 Av N (Interstate 275’s Exit 24) on a regular basis here is an upcoming detour that will start sometime around 8 AM on Monday, 15 July 2013 according to this City of St. Petersburg news release. This is the CSX railroad crossing that is located on 22 Av N just west of Interstate 275. This crossing is part of the CSX Clearwater Subdivision track and I have noticed that CSX has been upgrading the railroad crossings on the Clearwater Subdivision all over the place. The major customer on the CSX Clearwater Subdivision is the St. Petersburg Times, who receives shipments of newsprint at their printing plant on 34 St N at 13 Av N by way of a spur track that connects into the main track. Which leads me to wonder if the St. Petersburg Times (I prefer to refer to that name rather than the misnamed Tampa Bay Times, thank you very much) ever decides to move their printing plant elsewhere, what is going to happen to the CSX Clearwater Subdivision? One idea would be the sale of the entire Clearwater Subdivision track to the Florida DOT to be used as a light rail or commuter rail corridor, with CSX retaining trackage rights to serve the customers that still receive goods via rail. Besides, rail in the Tampa/St. Petersburg area – especially light and/or commuter rail – is good for our area. And it is desperately needed if we want to compete with Orlando and Miami/Ft. Lauderdale as Florida’s metropolitan areas. The railroad crossing replacement work is expected to be completed by 18 July 2013, according to the City of St. Petersburg press release. While the 22 Av N crossing work is taking place, you will want to consider using 38 Av N if you need to get to Interstate 275 from US 19 or 28 St N or vice versa. I know, this may be a minor inconvenience when a closure has to take place. However, in the end the railroad crossing at 22 Av N west of Interstate 275 will be a much better ride. We’re right into 2013 already and I hope everyone had a safe and happy New Years. Whether you stepped out on the town to ring in the New Year or decided to stay at home and watch the ball drop on Times Square in New York City, I’m sure you had a great New Years. As we were closing out 2012, an unfortunate head on accident happened on southbound Interstate 275 just north of the Pinellas Point Drive S exit (Exit 16). According to this article in the St. Petersburg Times by staff writer Laura Morel, a Pontiac driven by Sandra Weems was headed northbound in the southbound lanes of Interstate 275 collided with a van headed south. The driver and passengers of the van were taken to Bayfront Medical Center where two had minor injuries while two had serious injuries. Unfortunately, Sandra Weems was pronounced dead at the scene. How could Sandra Weems drive the wrong way northbound in the southbound lanes of Interstate 275? From reading this article, Sandra probably entered Interstate 275 at Pinellas Point Drive South (Exit 16) onto the southbound exit ramp. 1. The ramp is protected by only two “Do Not Enter” signs on either side. According to the federal Manual of Uniform Traffic Control Devices (MUTCD) two “Wrong Way” signs on either side of the ramp facing traffic going in the wrong direction are supposed to be installed midway between the exit and the intersecting street. (According to the recent edition of the MUTCD, those “Wrong Way” signs are considered optional, but I think these should be mandatory (see Section 2B.41 and Figure 2B-18)). 2. The ramp dips down from Interstate 275 level to ground street level due to the way it is designed. When this segment of Interstate 275 opened in 1987 the interchange at Pinellas Point Dr S used to have traffic signals but these were removed due to low traffic counts. 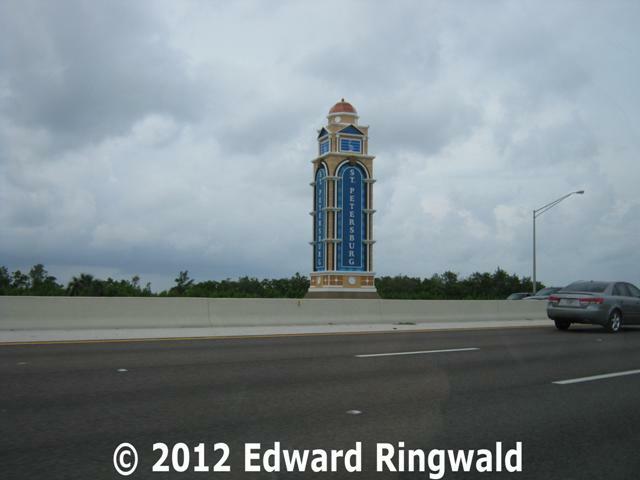 Perhaps the Florida DOT should have installed – midway on the exit ramp – a red blinking signal plus an alarm bell to warn motorists going the wrong way along with a fixed Wrong Way sign. The way the off ramp to Pinellas Point Dr S from southbound Interstate 275 was designed, you can’t see what is ahead of you until you are practically on top of the off ramp headed downward to street level. Yes there are stop ahead signs once you are on the ramp and stop signs once you are right at Pinellas Point Dr S, but it’s a matter of sight distance. If someone enters the southbound exit ramp to Pinellas Point Dr S from Interstate 275 going the wrong way, practically no one exiting would see it until it’s practically too late. This would be akin to the ramp onto eastbound Interstate 375 from southbound Interstate 275 (remember when a tanker truck went over the guardrail and ended up in a maintenance yard below? ), only the Interstate 375 ramp is a sharp curve to the left compared to the limited sight distance from Pinellas Point Dr S.
The solution that the Florida DOT should consider is a red blinking signal and audible alarm mounted on top of a wrong way sign located midway on the ramp between the point of exit and the intersecting street. A sensor buried in the pavement would detect a vehicle going the wrong direction setting off the red blinking signal and alarm. There is an installation like what I described on northbound Interstate 75 at the Webster exit (Exit 309) south of Bushnell; it is installed on the northbound off ramp due to the ramp’s circular design. In fact, there used to be a similar wrong way alarm setup on Interstate 275 at the Tampa Airport exit (Exit 39) when there was a ramp to Cypress Street that was built in the mid-1970’s as part of the direct access ramp from St. Petersburg right to Tampa Airport. Unfortunately, access to Cypress Street was removed when the interchanges in the airport vicinity were revamped a few years ago. It worked on the same principle: If a vehicle were to go the wrong way southbound onto the northbound Interstate 275 lanes a sensor buried in the pavement would set off a blinking red signal and alarm to warn traffic. 1. Install wrong way signage along with blinking red signal and audible alarm, all facing traffic going the wrong way. There would also be a blinking red signal facing traffic exiting the highway to let motorists know of the presence of a wrong way motorist on the ramp. 2. Put back the traffic signals that were originally installed when the Pinellas Point Dr S interchange at Interstate 275 (Exit 16) opened in 1987. However, there are certain conditions – called warrants according to the MUTCD – that have to be met before a traffic signal can be installed. With the low vehicle counts that exist, it is highly unlikely that the traffic signals would be reinstalled. As the sun starts to set on 2012, perhaps we can start on an Interstate 275 related topic – transit related, that is. You probably know this already, but we are one of the few metropolitan areas in the United States that has no meaningful mass transit system. In other words, we have just buses with schedules that are most of the time inconvenient. Translation: Owning a car is mandatory, unless you are lucky enough to live close to work (such as downtown St. Petersburg or downtown Tampa, for example). For the Tampa Bay region (Tampa/St. Petersburg) to succeed and be competitive with other metropolitan areas in the country, our region’s transit system needs a complete overhaul to include rail based mass transit. Sure we can widen Interstate 275 in Tampa to eight lanes but it comes with a major price tag: Land acquisition on either side of Interstate 275 in order to make the expansion among other things. In other words, simply widening Interstate 275 is not enough to fix our region’s transit woes. I came across this article I found in The Tampa Tribune about bus service between downtown Tampa and Tampa International Airport. According to that article, it is possible to ride a HART (Hillsborough Area Regional Transit) bus from downtown Tampa to Tampa International Airport to help save on uber expensive taxi cab fare but there is one catch: Transit time between the airport and downtown is 42 minutes, give or take, and the route follows not Interstate 275 but Kennedy Blvd. (FL 60). You know what taking Kennedy Blvd. to downtown from the airport and vice versa is, especially if traffic on Interstate 275 is backed up due to an accident and you have to use Kennedy Blvd. as an alternate route: Several traffic signals and yet another major backup during the weekday on eastbound Kennedy Blvd. when you get past Lois Avenue, as Kennedy Blvd. narrows from three to two eastbound lanes just before Dale Mabry Highway (US 92). The end result is stop and go traffic, which motorists and buses are subjected to daily. The solution, according to The Tampa Tribune article, is this: Transit service between downtown Tampa and Tampa International Airport can be made quicker but not using a rail-based solution. Instead, the plan calls for bus rapid transit between the two locations utilizing not Kennedy Blvd. but Interstate 275. That might sound OK, but I think bus rapid transit is not enough (in fact, not even the answer). Why? Even if such a route utilizes Interstate 275 between downtown Tampa and Tampa International Airport, buses would be subjected to the same delay as motorists, especially if there is an accident causing a partial or complete closure of Interstate 275 at some point requiring traffic to detour. In downtown Tampa between the Marion Street Transit Center and Interstate 275 at Ashley/Tampa Streets (Exit 44), buses would have specialized equipment on board that would change traffic signals in favor of the bus. Again, once a bus is on city streets it is basically subject to the same traffic delays as motorists are. With the widening of Interstate 275 between the exit for Tampa International Airport (FL 60, Exit 39) and downtown Tampa just before the Hillsborough River now taking place, there is ample space in the median to accommodate rail based mass transit – a commuter rail line, a light rail line or even Amtrak service to St. Petersburg (which has not seen an Amtrak train since 1984; all Amtrak service is out of Tampa Union Station as we know today)! Using that space in the newly expanded Interstate 275 median thanks to the widening that is taking place, perhaps a light rail line could be constructed between downtown Tampa and Tampa International Airport, perhaps as the first line of a network of light and/or commuter rail lines linking Tampa with St. Petersburg, Clearwater, New Tampa and other locations in the Tampa Bay region with buses providing the feeder service into the rail system. Perhaps the folks at HART as well as TBARTA (the Tampa Bay Area Regional Transit Authority) ought to revisit transit between downtown Tampa and Tampa International Airport from a rail based perspective rather than a bus based perspective. From what I have read, studies have shown that rail based transit leaves less of a carbon footprint in that electricity is used (especially for light rail systems – if you want an example, look no further than the TECO Streetcar Line that connects downtown Tampa with Ybor City, but the electric lines can be fixed using a third rail concept to make the surrounding area more appealing), rather than using diesel fuel as buses use today. Commuter rail and Amtrak, from what I understand, uses diesel fueled locomotives but their consumption is greatly reduced when you compare it to a bus that uses regular streets and highways. In fact, a recent Bay News 9 I-Poll asks this question: Do you think the Tampa Bay region is ready to support a light rail system? As of 30 December 2012, 51% is saying yes while only 44% are not. I think the people of Tampa and Hillsborough County are getting the message when they defeated a measure on the ballot that would allow a light rail system to be constructed using tax monies to finance its construction. To me, I think the reality of congested traffic and longer commutes is setting in, and it is pronounced as every year goes by in the Tampa Bay region without a reliable and workable mass transit system based on more choices than what we have today. And another Tampa Bay region mass transit issue should be fixed if and when the day light and/or commuter rail comes: The merger of HART and PSTA (Pinellas Suncoast Transit Authority) into one system, run by TBARTA which would be a comprehensive mix of light rail, commuter rail and buses. OK. Let’s change gears and head towards the sun rising on 2013 and the new year. Every New Year’s Eve I put out a reminder on celebrating the holidays safely, whether it may be New Year’s Eve, 4th of July or even the unofficial holiday of Super Bowl Sunday. You can find these tips to celebrate the holidays such as New Year’s Eve safely right here at Interstate275Florida.com (this link will open a PDF document in a new window). Just remember, if you are celebrating New Year’s Eve and the beginning of 2013 and alcoholic beverages are part of the celebrations, may I give you some words of advice, especially if you had too much? 1. Designate a driver to take you home. 2. Call a taxi cab and have a taxi cab driver take you home. 3. Call AAA’s Tow To Go at 1 (855) 286-9246, according to this recent St. Petersburg Times Dr. Delay article. 4. Stay the night at a friend’s house. 5. Stay the night at a hotel, such as the Hilton Downtown St. Petersburg Bayfront, the Hampton Inn Downtown St. Petersburg or any other hotel in the Tampa/St. Petersburg region. Rates may be high for New Year’s Eve, but it’s better to spend $150-$175 for one night’s hotel room than spending at least $10,000 defending yourself against a DUI charge, if not more. (Not to mention spending the first few hours of 2013 in the Pinellas or Hillsborough County Jails in their respective booking and holding areas, as you will not be able to even make bail until you are sober enough). 6. The Tampa Bay region’s law enforcement agencies – such as the Florida Highway Patrol, the Pinellas County Sheriff’s Office and the Hillsborough County Sheriff’s Office, as well as the St. Petersburg Police Department and Tampa Police Department, just to name a few – will be out in full force New Year’s Eve and New Year’s Morning with active patrols looking for impaired drivers as well as the use of DUI checkpoints. If you are pulled over and caught, you will be arrested for DUI. Once the officer or FHP trooper puts those nickel plated law enforcement regulation handcuffs on you behind your back it is the beginning of what lies ahead as far as a DUI arrest is concerned. 7. DUI can have serious ramifications as far as your future is concerned – your job, your career, even taking a trip to Canada. (Convicted of a DUI? You will have an extremely hard time entering Canada for a vacation trip!) Besides, your auto insurance rates will soar right through the roof, so much that you will be a high risk driver and insurance companies will either charge you extremely high rates or drop you altogether. And one more thing: Forget about renting a car if you were recently convicted of a DUI – the major car rental agencies, such as Alamo and Dollar, do check driving records with the swipe of your driver’s license; all it takes is for the car rental agent to find out that you had a recent DUI conviction and the agent denies your rental. Besides, it’s way more embarassing than your credit card being declined. And you will have a record for a DUI, even if it’s your first time. Florida law prohibits judges from withholding adjudication of guilt on any DUI charge, if you are found guilty. Sobering? New Year’s Eve, the stroke of midnight and the sun rising on 2013 doesn’t have to end in a DUI arrest, or worse. Let’s start 2013 with New Year’s Day on a positive note! Happy New Year from Interstate275Florida.com! By now you probably drove by the entry monument for St. Petersburg when you head south on Interstate 275 just before the 4 St N exit (Exit 32). If you haven’t read my previous blog entry on the entry monument north of 4 St N in St. Petersburg, please feel free to do so.﻿ After all, that entry monument really puts St. Petersburg’s best foot forward. Unfortunately, the St. Petersburg Times – er, the misnamed Tampa Bay Times – has decided to go pro-Tampa and be anti-St. Petersburg. This article written by Times staff writer Michael Kruse (in print on 2 December 2012) is nothing more than the worst anti-St. Petersburg article I have ever seen since the day the St. Petersburg Times became the Tampa Bay Times on 1 January 2012. As such, this blog entry shows my disappointment with the St. Petersburg Times over how it covers its stories in this present day and age. 1. You mention that the sign is “monstrous”. This sign is not monstrous in any way whatsoever – it is a beautiful sign seen by St. Petersburg residents as well as visitors, not to mention commuters headed back home to St. Petersburg after a busy work day in Tampa. 2. The sign was not paid for with our tax dollars. The City of St. Petersburg was going to construct this sign but it had to be put on the shelf because of budget cutbacks. However, a prominent St. Petersburg businessman – Bill Edwards, whose company, Big 3 Entertainment, manages the Mahaffey Theater in downtown St. Petersburg – came up with the money to build that monument. 3. You took it on yourself to compare that entry monument to something from Celebration (which is next to Disney World) or Lakewood Ranch (a community south of Bradenton), an entrance to an apartment or condominium complex or a gateway to an outlet mall. How dare you say that about the sunshine city of St. Petersburg? 4. I was born and raised right here in St. Petersburg. In fact, I grew up as every section of Interstate 275 was being built southward in segments from the Howard Frankland Bridge to the Sunshine Skyway Bridge, including the two downtown St. Petersburg connectors, Interstates 375 and 175. The St. Petersburg Times – of course the misnamed Tampa Bay Times – should be ashamed of themselves for even writing this article to begin with. This article is definitely pro-Tampa and anti-St. Petersburg on the spot. Speaking of the entry monument on Interstate 275 right before you get to the 4 St N exit (Exit 32), this is the most beautiful and welcoming work of art that welcomes residents and visitors to the sunshine city of St. Petersburg. Even in the tough financial times the City of St. Petersburg is facing, at least one prominent local businessman – Bill Edwards – stepped up to the plate and provided the funding to get this entry monument built and done. First impressions always count. After all, this entry monument puts St. Petersburg’s best foot forward. Besides, this article shows clearly why the misnamed Tampa Bay Times does not care about St. Petersburg anymore. After all, the St. Petersburg Times made a monumental mistake on 1 January 2012 when it changed its name to the pro-Tampa, anti-St. Petersburg Tampa Bay Times. We have two other entry monuments at the eastern ends of both Interstates 375 and 175 in downtown St. Petersburg. Those entry monuments are not “monstrous” contrary to what the St. Petersburg Times mentioned in the article I have recently seen. As a St. Petersburg resident, I am proud of these entry monuments every time I ride by them. As for the St. Petersburg Times, it used to be a great newspaper until it started covering more and more Tampa related stories. As time wore on, the St. Petersburg Times covered less and less St. Petersburg, even going to the point of calling St. Petersburg “South Pinellas”. And, on 1 January 2012, the St. Petersburg Times did a lot of collateral damage to themselves by renaming it the Tampa Bay Times. All you will find in the St. Petersburg Times today are articles that are nothing more than sensationalized and speculated for maximum fear effect. You can read more about this in one of my blog entries over at the Edward Ringwald Blog (that’s my other blog) about the credit crunch and the news media. And one more thing: Even though the St. Petersburg Times is now the Tampa Bay Times, it will still be referred to as the St. Petersburg Times in my book, especially for at least as long as it still maintains a headquarters at 490 1 Av S in beautiful downtown St. Petersburg, if not more. Have you noticed something new before 4 St N (Exit 32)? If you have been on southbound Interstate 275 coming into St. Petersburg from Tampa lately, you may have noticed a new structure that has been erected on the right hand side just before you reach the 4 St N exit (Exit 32). What is that structure being erected just north of the 4 St N exit? That structure is an entry monument welcoming everyone to the City of St. Petersburg. The monument is similar to the downtown St. Petersburg entry monuments located on the eastern terminuses of both downtown feeders, Interstate 375 and 175. The entry monument was proposed for the location north of the 4 St N exit for many years from what I understand. Unfortunately, there were no monies in the budget for the City of St. Petersburg to erect this important entry monument; however, a prominent St. Petersburg businessman, Bill Edwards (whose company, Big 3 Entertainment, operates the City owned Mahaffey Theater), stepped up to the plate and donated money for the entry monument’s construction. The new entry monument on southbound Interstate 275 just before 4 St N (Exit 32) does indeed put the City of St. Petersburg’s best foot forward in welcoming our visitors to our city. After all, first impressions last a lifetime! If you were having some difficulty logging on to Interstate275Florida.com for some time Sunday evening (11 March 2012), it’s because I just uploaded several revisions to the Interstate 275 Florida website for your reading pleasure! After all, with all the construction taking place at any given moment out there on Interstate 275 in the Tampa/St. Petersburg area, I try to make the changes as time permits. On the northern terminus page, I have changed out the pictures for the exit onto FL 56. Originally the Florida DOT designated this exit as Interstate 75’s Exit 275 but as I reported in an earlier post the potential for motorist confusion existed. So, on go the overlays (also known as FDOT Green-Out, akin to the white-out that you use when you need to correct something on paper; white-out sure beats the old fashioned Liquid Paper these days!) and Exit 275 (FL 56) has been redesignated as Exit 59 for northbound Interstate 275. Let’s head over the Howard Frankland Bridge to St. Petersburg and I have noticed that the Exit Only panels on northbound Interstate 275 at 54 Av N (Exit 26) were getting unreadable. What does the Florida DOT do to correct this despite the tough budget times that the State of Florida is in? Place a yellow overlay with the words “Exit Only” in wider FHWA Highway Gothic font over the existing sign! The folks over at the Florida DOT District 7 camp on McKinley Drive in Tampa (located south of the University of South Florida’s main Tampa Campus on Fowler Avenue) like to come up with creative ways to extend the life of a highway sign to get more mileage out of the signage for many years. OK. Let’s zip back on the Howard Frankland Bridge through downtown Tampa over to Fowler Avenue (Exit 51). A project is underway to make two right turn lanes for traffic coming from northbound Interstate 275; this should provide some relief for motorists headed to destinations east of Interstate 275 on Fowler Avenue, particularly the University of South Florida so that students can get to classes on time. Let’s do a U-turn underneath the overpass at Fowler Avenue and head back south on Interstate 275 towards the world’s finest airport, Tampa International Airport. As you have noticed, the airport interchange has undergone a major transformation from the short ramps that were built in the early 1970’s to the major, if not better, ramps that were built. So, I have added a section of pictures that reflect the newly built ramps of the airport interchange reconstruction project and I have left up the ramps that were built in the early 1970’s before construction began so that you can get a good perspective of before and after. I am also announcing a new feature here on Interstate275Florida.com. As you probably have noticed already, gas prices are topping over the $4.00/gallon mark with no end in sight. Naturally, I can’t help tame these high gas prices but I can show you where you can find the cheapest gas out there. As such, I have teamed up with TampaGasPrices.com – part of GasBuddy.com – to provide you with where you can find the cheapest gas prices in the Tampa/St. Petersburg area. So, what are you waiting for? Head on over to the Gas Prices page today! So, there you have it: Changes and additions to Interstate275Florida.com to help keep up with the construction going on. Keep checking back here at Interstate275Florida.com frequently and often – in fact, put Interstate275Florida.com in your browser’s bookmarks so that you can refer to it frequently and often. I know, it’s been a while since I posted here on the Interstate 275 Florida Blog. First of all, I got some good news for those of you that use Gandy Blvd. and the Gandy Bridge as an alternative to the Howard Frankland Bridge, especially during the morning and evening rush hour or when there is a major incident on the Howard Frankland resulting in authorities advising motorists to use Gandy to or from St. Petersburg. According to an email from the City of St. Petersburg that I receive weekly called Foster’s Weekly Forecast, improvements to Gandy Blvd. from 16 St N to 4 St N will soon take place which will transform the at grade intersections of Gandy Blvd. at 16 St N, Martin Luther King St N and 4 St N from the at grade intersections as they are now to overpasses – and believe me, these overpasses are much needed! Work is supposed to begin in September 2012, according to the folks over at the Florida DOT. Could this be the start of a project to eventually upgrade Gandy Blvd. to a limited access highway with frontage roads providing access to Gandy Blvd. businesses and a direct straight through connection to the Selmon Crosstown Expressway? Unfortunately, improvements on the Tampa side have run into plenty of NIMBY-ism but this connection is desperately needed especially to help with hurricane evacuation; remember the major backup on the Howard Frankland when Hurricane Charley almost hit Tampa/St. Petersburg in 2004? OK. Now on to our main topic. As you have more than likely seen everywhere you turn in the Tampa/St. Petersburg area, you have seen gas prices climbing steadily up with no end in sight. As of 3/2/12 prices for gas are closing in on the $4.00/gallon mark and the news media – whose purpose is to make you scared – is claiming that we may see $5.00/gallon or more. In fact, most other Florida cities are seeing already over $4.00/gallon. Same thing throughout the rest of the United States from what I heard. Believe me, that’s not good news. For me, I thank goodness that I traded in my mid-size car that featured a monster-size gas tank for the economy and savings of an economy car. 1. Use motor oil that is recommended for your engine. What is recommended varies from car to car, you may want to check your vehicle owner’s manual. By the way, make sure that you have your oil changed at whatever your vehicle manufacturer recommends; this is usually 3,000 miles in most conditions. Be sure when you have your car’s oil changed that you go to a reputable service place. 2. Check and replace your air filter regularly – a clogged air filter can reduce mileage by 10%. 3. Keep engine properly tuned – poorly tuned engine can cost 4%, a faulty oxygen sensor as much as 40%. 4. Keep tires properly inflated; fuel mileage decreases 0.4% for every pound tires are under-inflated. 5. Avoid all aggressive driving; rapid acceleration and rapid braking lower your mileage by 5% to 30%. Besides, leaving earlier so that you can safely get to your destination if you have to be somewhere at a specific time helps! 6. Reduce your speed; at highway speeds, every 5 mph you drive over 60 mph increase your fuel cost by 8%. It pays to stay within the speed limit; you’ll save time and money not only on gasoline but speeding fines as well. Did I say speeding fines? They are more – if not a lot more – than your car loan payment. 7. Remove any extra weight from your vehicle; an extra 100 pounds can reduce mileage by 2%. 8. Avoid excessive idling. When at idle you are getting 0 miles per gallon – think about it. It is a misconception that it takes more gasoline to restart than you save by turning it off. 9. If your vehicle can use regular fuel, use it. Don’t spend the extra premium for premium fuel if you don’t need it. 10. Plan your trips in advance; try to use interstate highways such as Interstate 275 in the Tampa Bay area wherever possible. That way, you can minimize your wait at traffic signals and not waste gasoline by idling while waiting for the traffic light. And you won’t have to worry much about red light cameras! 11. Consider using public transit if it’s available in your area. Think of the gas you would save every week. Employers may have an incentive program for you using public transit to and from work; check with your employer. With the high gas prices we are now experiencing with no relief in sight, the high gas price situation should be a wake-up call on a more serious note to the leaders of the Tampa/St. Petersburg region as well as people who sit in traffic all day getting to and from work over considerable distances: Rail based mass transit is desperately needed if the Tampa/St. Petersburg region wants to survive if and when the economy begins to recover. Sure we can build a 20-lane Interstate 275 in Tampa but that’s not going to do any good. Sure we can add more buses or add dedicated bus lanes but that’s not going to to any good; after all, buses share the same roadway that we motorists do. Perhaps the voters of Hillsborough County who voted against a commuter rail system a year or two ago will more than likely change their mind once gas prices climb to a level that people will have to end up moving closer to their workplace to help minimize the commute wherever possible. Unfortunately, with the housing market at its lowest level it might be hard: Either sell your home and move to a location closer to work or find another job closer to home. None of us can control the price of fuel but we can all work towards reducing the amount of fuel we use to help our personal budgets. Ask yourself, especially if you or your family is planning a vacation: Would you rather drive the 200+ miles on Interstate 75 from Tampa to Ft. Lauderdale or take Amtrak or Southwest Airlines to Ft. Lauderdale from Tampa and back? Just a thought.